2019 FOURTH OF JULY on Flagler Blvd for The City of West Palm Beach. 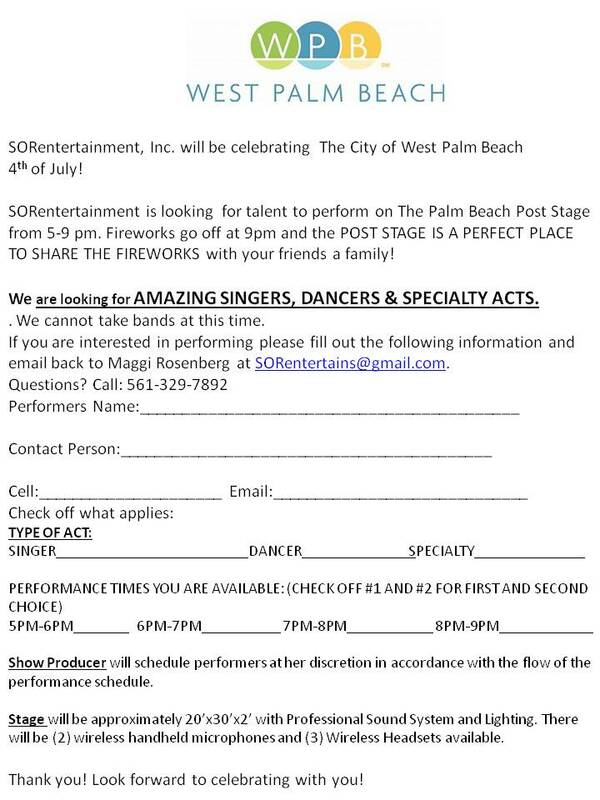 SORentertainment is looking for amazing talent to perform on The Post Stage from 5-9 pm.BRING YOUR FAMILY, FRIENDS to watch you perform and WATCH THE FIREWORKS that begin at 9PM! THE POST STAGE ISTHE PERFECT SPOT; so so bring your blankets, chairs and reserve your spot. SINGERS, DANCERS & SPECIALTY ACTS. We cannot take bands at this time. If you are interested in performing please fill out the following information and email back to Maggi Rosenberg SORentertains@gmail.com Questions? Call: 561-329-7892 Performers Name:___________________________________________ Contact Person:__________________________________________ Cell:_____________________ Email:_____________________________ Check off what applies: TYPE OF ACT: SINGER______DANCER______SPECIALTY ACT_________ PLEASE CHECK OFF PERFORMANCE TIMES YOU ARE AVAILABLE: (CHECK OFF #1 AND #2 FOR FIRST AND SECOND CHOICE) 5PM-6PM_______ 6PM-7PM______ 7PM-8PM_______ 8PM-9PM___________ Producer will schedule performers at her discretion in accordance with the flow of the performance schedule. Stage will be approximately 20'x30'x2' with Professional Sound System and Lighting. There will be (2) wireless handheld microphones and (3) Wireless Headsets available Thank you! Look forward to celebrating with you!